STANFORD, Calif. — Michael Marmor, MD, wanted to know what it was like to see through the eyes of an artist. Literally. Degas and Monet were both founders of the Impressionist era, and the style of both painters was well-formed before their eye disease affected their vision. But their paintings grew significantly more abstract in later life as, coincidentally, their eye problems increased. “Contemporaries of both have noted that their late works were strangely coarse or garish and seemed out of character to the finer works that these artists had produced over the years,” Marmor wrote in a paper titled “Ophthalmology and Art: Simulation of Monet’s Cataracts and Degas’ Retinal Disease,” which was published in the December issue of the Archives of Ophthalmology. It’s well-known that such artists as Monet, Degas, Rembrandt, Mary Cassatt, and Georgia O’Keefe all reached their heights of artistic vision while facing a decline in their ocular vision. Marmor chose to focus on Degas and Monet because both artists suffered from eye disease that was documented in historical records, journals and medical histories. Degas had retinal eye disease that frustrated him for the last 50 years of his long career. Monet complained of cataracts interfering with his ability to see colors for 10 years before he finally underwent surgery to have them removed. “We understand better from these simulations what Degas and Monet struggled with as vision failed,” Marmor said. One museum curator, Richard Kendall, called Marmor’s publications on Degas and Monet “of considerable value to the art historical community.’’ “I consider him one of the most thoughtful commentators from the scientific community on questions of eyesight among French 19th-century artists,’’ said Kendall, who is curator-at-large at the Sterling and Francine Clark Art Institute in Williamstown, Mass. To create the images of the artists’ paintings as seen through their own eyes, Marmor used Adobe Photoshop software for photo editing. He adjusted the blur and filter settings to what he determined would be the different stages of Degas’ and Monet’s eye disease, based on medical expertise and historical research. Degas suffered failing vision from 1860 to 1910. As his eye disease progressed, his paintings grew increasingly rough. From treating hundreds of patients with retinal disease similar to what Degas suffered, Marmor said, he knows that the shading and contrast of images becomes less defined and blurriness increases as such illness progresses. 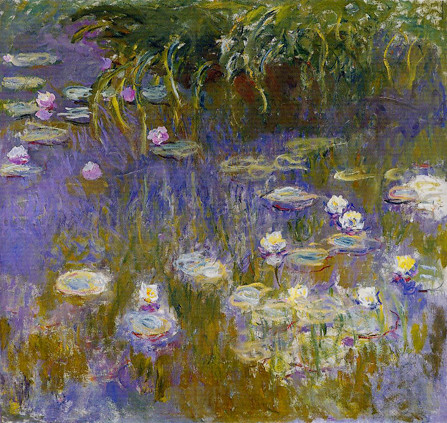 Monet wrote of his growing frustration with his deteriorating vision, describing how he was forced to memorize where the colors were placed on his palate. In 1914 he wrote in his correspondence that colors no longer had the same intensity. “Reds had begun to look muddy,’’ he wrote. “My painting was getting more and more darkened.” He was forced to rely on the labels on the tubes of paint in place of his own vision. Click to view slideshow of images showing changes in Degas’ and Monet’s painting styles over time, as well as simulations of how their eye disease may have affected what they saw.